Weather is horrible today. So no cycling. For my next WIP (Work in Progress), I fancy a set of cushions for the front room, and what better than a matching pair using this pattern. When finished, this centre piece will only measures 30 x 30 cm, and I will want larger cushions than that, so I shall incorporate this into the Sophie Universe pattern – something I have done before with another center piece to great success. The pattern for this is not mine, so here are the details should you want to make this for yourself as well. Pretty isn’t it? 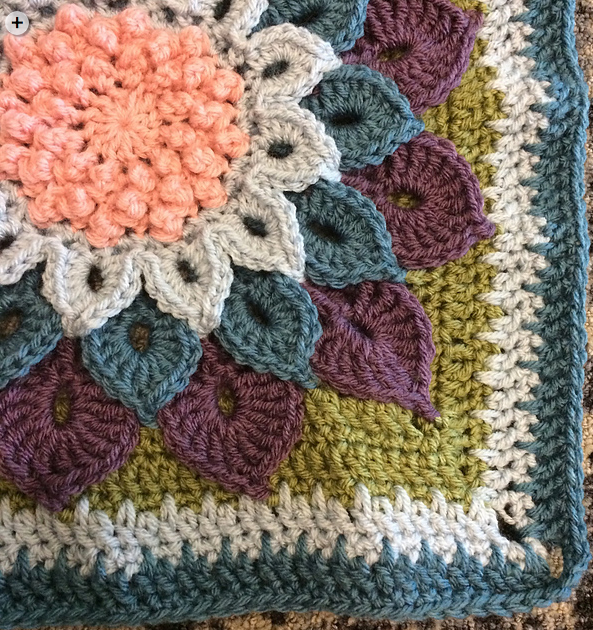 Once the centre piece is finished, I will need to follow on with the ‘Enchanted Garden’ pattern to complete the large square for the front of the cushion. The Enchanted Garden pattern has a very excellent photographic tutorial showing you stitch by stitch how to make your crocodile flower metamorph into the most amazing panel for your cushion – or the tote bag, should you prefer, as suggested originally by Courtney Laube.